There’s a chill in the morning air, the leaves are hinting at the idea that they’re thinking of turning colors, but the days are still warm. Winter may seem like it’s still a ways off, but you never know when that first Nor’easter of the season is going to drop the hammer on Northern Virginia. So it’s absolutely essential to prepare your asphalt for winter now, before the stores sell out of milk, bread, Skittles and toilet paper. But how to begin? Water is essential for life, but it is your asphalt’s worst enemy. Survey your asphalt parking lots now, while it’s still warm outside. Notice any cracks or holes? If so, these will be the first places where that first big snow melt will trickle down into the sub base to get ready for the relentless freeze-thaw cycle. As water freezes it expands. As it melts, it contracts. When this happens over and over again all winter long underneath your asphalt, this is a recipe for longer cracks, alligator cracking and finally, dreaded potholes. So before this happens, call Espina Paving at 703-491-9100 to have us come and seal cracks and repair potholes. In fact, it’s not even too late to have your entire parking lot sealcoated in order to prevent even the smallest cracks from letting in water and then later becoming a bigger problem. Schedule these services as soon as possible while the weather is still decent. It’s anybody’s guess how much snow we may or may not get this winter. Northern Virginia is notoriously unpredictable in the weather category. But it’s always better to be safe than sorry. First of all, make sure to hire an experienced snow-removal company to take care of your plowing needs. Amateurs are notorious for scraping more asphalt and damaging more curbs than they need to. Also, make sure to place markers around the curbs and islands in your parking lot that will stick up visibly above the snow to alert the snowplow drivers to their presence. This will help you avoid more expensive and troublesome damage. Are your drains and manholes cleared and flowing properly? This is very important as winter storms come and melt because standing water can also cause problems on top of your asphalt. If it freezes over, you’ve got an ice rink no driver or pedestrian is going to want to venture over. Make sure the drains and manholes are cleaned out and ready to move water away from your pavement expeditiously! Nobody knows when the next winter storm is going to hit, but we can all be pretty certain that it will hit sometime this winter. Preparing your asphalt for winter now is the key to preventing more expensive damage in the spring, and keeping your patrons and employees safe and sound when the temperatures dip and the snow flies! 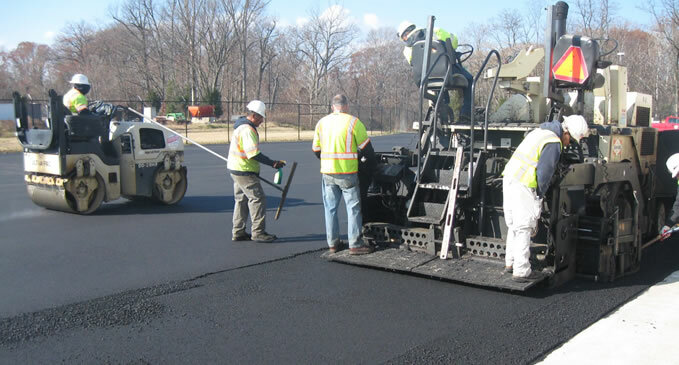 Contact Espina Paving today to schedule an asphalt winterization appointment: 703-491-9100.